Time spent outdoors, silently gliding past fields and creeping up on deer that do no more than raise their heads and watch us cycle past. Feeling the sun on my back, the breeze on my face and listening to birdsong. Watching my body re-shape itself from it's curvier winter swaddling, back into a slightly more sculptured form; with muscles on my legs, reduced spare tyre around my middle and more toned upper arms. The sense of adventure; packing the bikes for a night away, setting off from home and knowing it's just my legs (with Adrian's navigation) that will power me somewhere new. 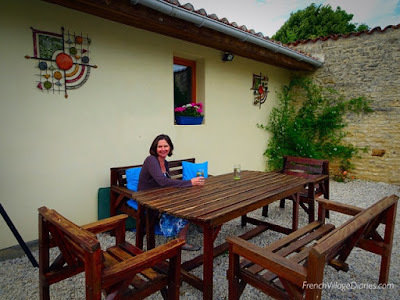 This was how I found myself at La Vie en Rose B&B last week, fifty kilometres from home in Champagne-Mouton, just over the border in the Charente department. You can read my full review for FreewheelingFrance here. 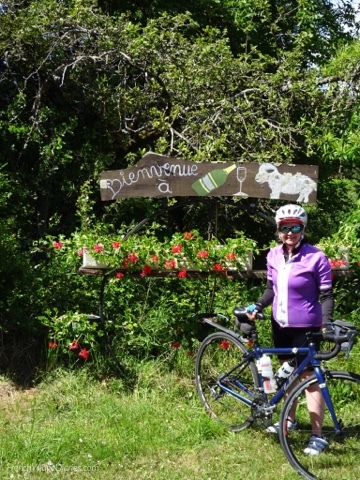 When we first started cycling, the Charente was our ‘go-to’ destination as they have a network of over 35 signed cycle routes, each route having 3 circuits of varying lengths, covering most of the department. Before Adrian invested in his Garmin and began planning our own routes, we would pick a Charente ‘boucle’, drive to the start point, park up and follow the signs for an afternoon ride. They are all well signed and well thought out, ensuring you avoid main roads, cycle through the prettiest villages and know where to find bars and restaurants along the way. Our route to La Vie en Rose in Champagne-Mouton took us on some familiar roads as we picked up sections of routes 31, 32 and 48 as well as places I recognised from the Flandres Charentaises Classic events we have taken part in. It really is a beautiful area to explore by bike; quiet roads, fern-floored chestnut forests offering cool shade, fields of sunflowers (not in flower just yet) and wheat that was starting to turn gold, plus villages with Romanesque churches and river valleys offering muscle stretching climbs and fast descents. 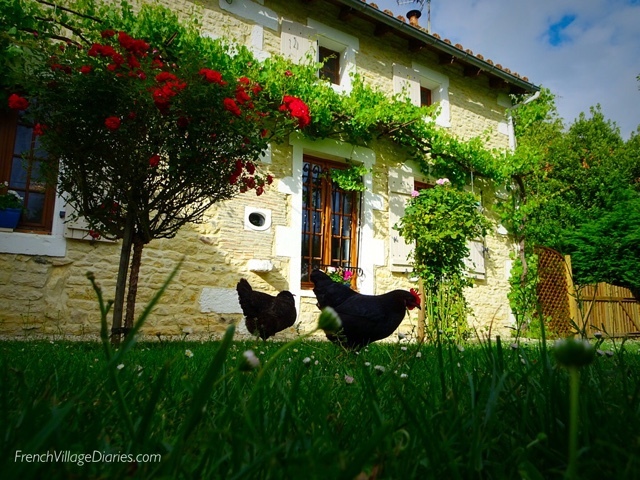 We arrived feeling tired but exhilarated and instantly fell in love with La Vie en Rose, a beautifully renovated stone cottage in a quiet hamlet where Sue and Gordon welcomed us like friends. 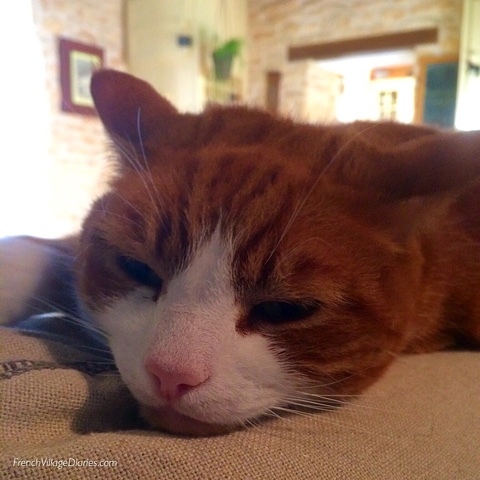 Their dogs, Dora and Bella also seemed very pleased to have us to stay and I can't thank Taz the cat enough for curling up on my lap and purring happily, while Mia slept on the sofa by my shoulder. It's been almost two years since we lost our cat Poppy and I do miss my cat cuddles. 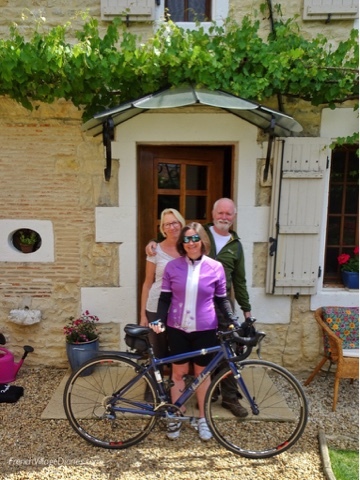 Sue and Gordon are keen to encourage cyclists to come and stay as, like us, they know how great the cycling in this area is, and their home was the perfect place to relax after a day on the bikes. Their large garden offers sunny or shaded seating, guests have full access to their lounge and we joined them for a delicious fish dinner. There are a few restaurants nearby, but not near enough for tired cyclists! I slept very well in a bedroom fit for a princess and their generous breakfast fuelled me all the way home. 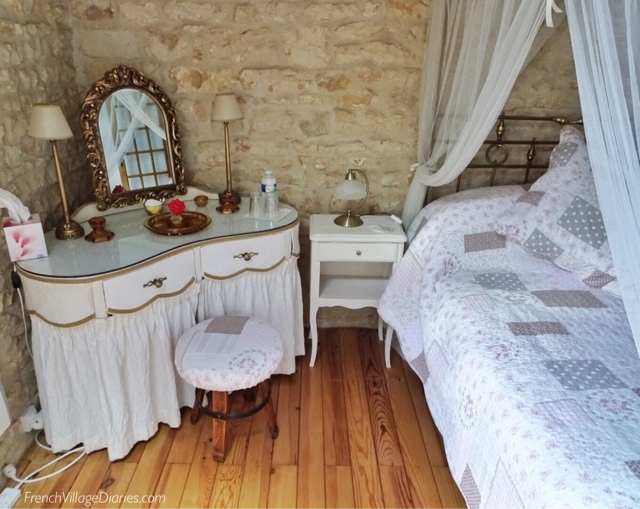 La Vie en Rose is just off the Tour de Charente, a 390km route taking in most of the Charente department and I would certainly recommend using it as an overnight stop. 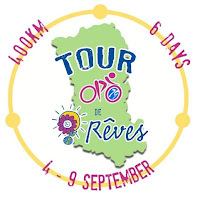 Having toured La Sarthe by bike last year and currently busy planning a tour of the Deux-Sèvres (Tour de Rêves) for later this year, I'm convinced it's the perfect way to spend a week exploring an area of France. 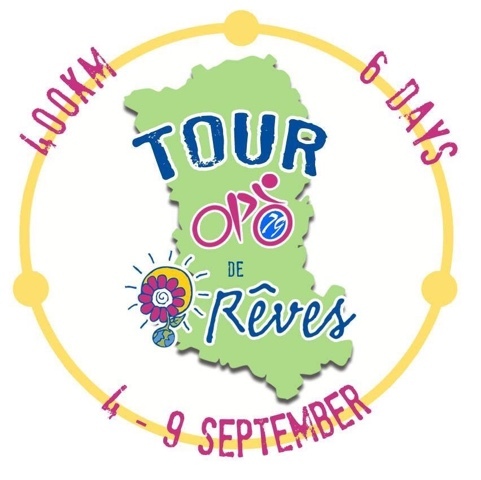 The 100kms we clocked up cycling to and from La Vie en Rose was also great training for our Tour de Rêves charity bike ride.